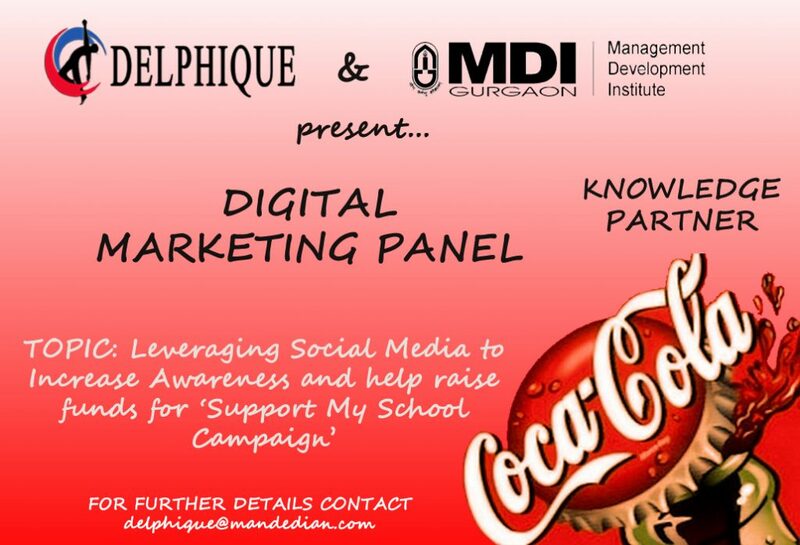 Delphique 2014, the National Management Convention of MDI, Gurgaon presents an opportunity to the students to be a part of the Digital Marketing Panel with Coca-Cola. The students associated with this research panel are working on “Leveraging Social Media to Increase Awareness and help raise funds for ‘Support My School Campaign’”. Ms.Asha Sekhar, Senior Manager – Integrated Marketing Communication at Coca-Cola shall grace the panel discussion with her esteemed presence. It will be a unique opportunity for students to present their research before her and gain from her enriching experience. The quest to make a difference in revitalizing rural and semi-urban schools led to formation of the partnership among NDTV, Coca-Cola and UN-Habitat. The partnership took the shape of the campaign “Support My School” in January, 2011. Today through Support My School, over 100 schools spread over 10 states can lay claim to better access to sanitation, water, playing facilities, libraries, computer centers and a more welcoming and learning environment. The company wants to leverage social media to increase awareness of the campaign and raise funds through the same. Assuming a budget of 10 lakhs for an agency, the students are expected to come up with a digital media strategy. The research objectives include building mass awareness, engaging communities and schools in providing solutions, bringing all stakeholders on a common platform and raising funds to directly support at least 250 schools. The students are working under the guidance of Mr.Sameer Pathak, Senior Manager – PAC for Coca-Cola for the research. About Coca-Cola: The Coca-Cola Company is an American multinational beverage corporation and manufacturer, retailer and marketer of nonalcoholic beverage concentrates and syrups, which is headquartered in Atlanta, Georgia. A global leader in the beverages industry, Coca-Cola was rated the world’s most valuable brand based on Interbrand’s best global brand study of 2011.